Relax and soak up the views from this homely cottage with stunning lakeside views. When you stay with us you can simply enjoy the beautiful countryside views and walks that surround our gorgeous cottages and soak up the tranquil environment while you relax in the garden and watch the sun set over the lake on your doorstep. With so many local tourist attractions you won't be disappointed - clay pigeon shooting, indoor surfing & flying, archery to name a few just under 20 minutes away. Everyone is welcomed into our cafe serving freshly ground coffee, homemade lunches and cakes with a licensed bar too! All just a stones throw from the cottage. If you enjoy golf, we offer FREE golf after midday or reduced green fees before midday on our 18-hole course. We also give all guests a reduced golf buggy hire fee too! We have an 8 bay Floodlit driving range and a lively enthusiastic golf coach who will custom make a tuition break if you require. We even have a small Pitch and Putt course – perfect for beginners, or even our FootGolf course (Golf but kicking a football!!!) which is great fun for anyone! FootGolf has now become a very popular sport and we have many families, with sometimes 3 generations enjoying themselves. Residents of the cottages have exclusive rights to Course Fishing immediately outside of their cottage but can also try any our 3 well stocked lakes too - day tickets purchased separately. We have a Laundry room with washing machine, tumble dryer and drying room (tokens at clubhouse). Just ask if you require the use of a Travel cot and extra z-beds for children. The Golf Club has been in our family since it was built and opened in 1991. We have built 4 cottages that overlook the wonderful views of our 18 hole golf course. We love everything that rural North Bedfordshire has to offer and want to share it with anyone who wants to join us! From stunning views and listening to the birds sing from your garden to long walks around neighbouring farmland, laughing with friends and family on our fun pitch & putt and FootGolf course, taking on the challenge of our 18 hole golf course, chilling in our cosy cafe with a hot drink and a slice of homemade cake or even learning a new skill of golf with our fun professional golfer. We think we have something to keep the whole family entertained! We're kicking the stuffiness out of golf - your free time is precious and we want you to enjoy every second of it! We welcome everyone here at Colmworth, Golfers, Non-Golfers, Cyclists Walkers and their dogs - basically anyone who wants to relax and have fun. Stunning lakeside views from your hot tub and garden. Great food and drink available just a short stroll away and lots of great rural walks to enjoy. FREE golf after midday on our 18 hole golf course. (Reduced golf before midday) Reduced Buggy Hire Residents of the cottages have exclusive fishing rights immediately outside of their cottage. Small fenced garden with hot tub, patio furniture and BBQ leading from the patio doors. Overlooking the lake and the golf course. Private, fenced garden and patio area for your use. Situated on the Golf Course wwith an 8 bay driving bay and Par 3 and footgolf course too. Relaxing Stay in the country. We thoroughly enjoyed our stay here. The fully equipped cottage is situated next to a small pond on the golf course that provides bucolic views. The main lounge area opens up to a small fenced garden area allowing enjoyment of the clean air. There is also a small, reasonably priced restaurant across the parking lot. We especially enjoyed the delicious surprise on the table upon arrival! I'm so pleased you enjoyed your stay and hope to see you again sometime in the future. 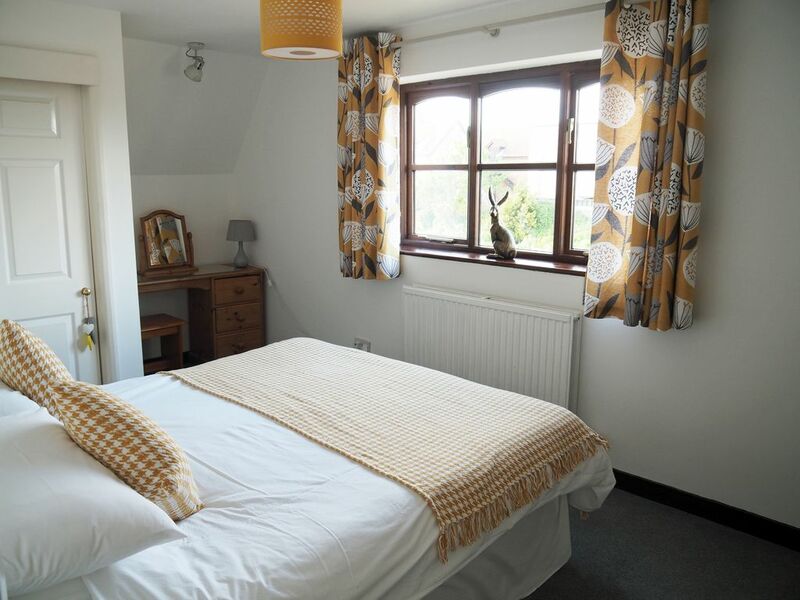 Three bedroomed cottage - all bedrooms roomy with good storage space. The kitchen / lounge a little on the small side, but still sufficient for our family of 5. Very well equipped kitchen, so good for self catering. Could have done with a few more mugs, but other than that great. Plenty of nice touches including a great big cake, tea, coffee & milk on arrival. Good fishing to be had right outside which was a big plus for my husband. I'm so glad you enjoyed your stay. Sounds like I had better get across to the cottage with some new mugs! Clean,& reasonable comfortable,with good golf ! Lounge Area a bit small for 4, Television also on the small side, a big one on the end wall would have been fab as Wimbledon week ! The fridge also a bit small struggled to keep much in it. Lovely setting and we throughly enjoyed the golf , though weather was a little on the dull/windy side to make the most of the garden area ! Golf, fishing, Footgolf and country walks onsite. The Plough restaurant in the next village of Bolnhurst is a must for a special meal.